Supporting informal child care providers caring for children under 5 years old through group learning and individualized home-based coaching. 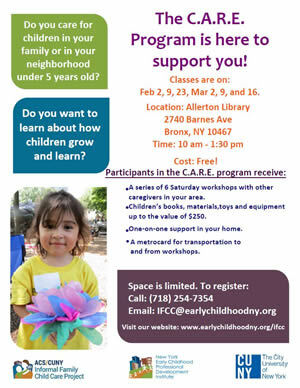 The needs of informal family child care providers present rich challenges and opportunities for service providers and policy makers in New York City. The Institute is piloting the CARE Program to design and test a more robust and responsive approach to the dynamic needs of informal providers and support the important role they play in the continuum of care for young children. You can also download our flyer to learn more. Sesame Workshop invited IFCC to help create a training video about Friend, Family and Neighbor (FFN) caregivers for service providers and others, as part of their Sesame Street in Communities (SSIC) initiative. Check out the video to learn more about FFN caregivers and our work.